At present, curative treatment options for HCC include liver transplantation, partial hepatic resection and, in some reported instances, percutaneous or surgical ablation.2 In 1996, Dr. Vincenzo Mazzaferro and colleagues defined the subset of patients with unresectable HCC for whom liver transplantation was the optimal treatment. Termed the “Milan criteria,” patients with a single HCC tumor < 5 cm in diameter or 2-3 tumors all < 3 cm in diameter, demonstrated overall and recurrence-free survival rates of 75% and 83%, respectively, at 4 years.3 Unfortunately, wait time for liver transplantation in patients with HCC has risen, increasing waitlist dropout rates and associated mortality. Dropout rates after 1 year of waiting for a liver transplant have been reported at 20% to 60%.4 Thus, to control tumor burden of those meeting Milan criteria, reduce the waitlist dropout for patients awaiting orthotopic liver transplantation(OLT), and provide downstaging of disease for those exceeding criteria, many centers have relied on pretransplant transarterial locoregional therapy (LRT). 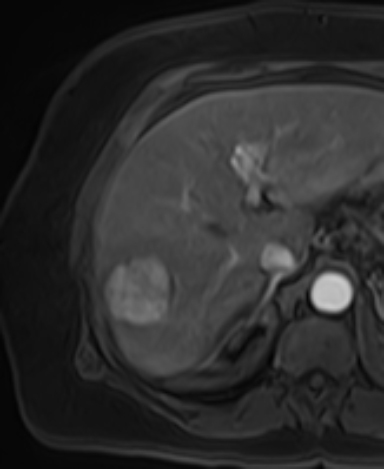 The increased use of LRT emphasizes the diagnostic radiologist’s need to be familiar with common therapies for treating and managing HCC. 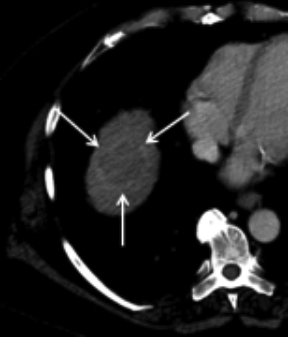 The radiologic hallmark of HCC, contrast uptake in the arterial phase and washout in the venous/late phase (Figure 1), remains fundamental to the diagnosis and post-treatment evaluation of lesions. This focused review will introduce the basic principles and forms of transarterial LRTs, briefly discuss the role of LRT in the management of HCC, examine assessment of imaging response to LRT procedures, and attempt to illuminate the nuances of interpreting post-treatment imaging. The normal liver receives a dual blood supply from the hepatic artery (25%) and the portal vein (75%). As the hypervascular HCC tumor grows, it increasingly depends on the hepatic artery for blood supply. 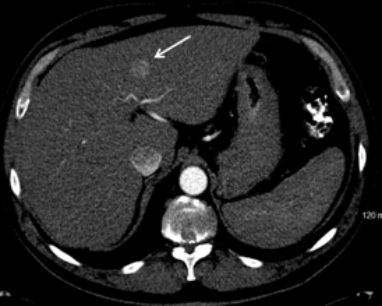 Once an HCC tumor nodule reaches a diameter of ≥ 2 cm, most of the blood supply derives from the hepatic artery (Figure 2).5 This unique dual blood supply property of the liver provides the rationale for exploitation via transarterial embolization, or purposeful blocking of the hepatic tumoral arterial supply, as the nutrient portal venous flow to the liver remains intact. 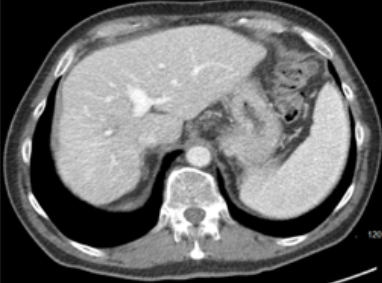 Transarterial LRTs play an important role in the management of HCC. The varying types of LRTs exert their effect by delivering ischemic, chemical or radioactive doses to targeted liver lesions. These common therapies have been shown to achieve reproducible downstaging for patients outside of Milan criteria attempting to be listed for transplantation (Figure 3), and extend bridging of patients already listed and awaiting liver transplantation.5 Some authors have also shown increased survival for transarterial chemoembolization (TACE) in 2 randomized controlled studies.6,7 Similarly, longer time to progression has been suggested with transarterial radioembolization (TARE) compared to TACE.8 The practice of treating HCC patients with transarterial LRT is common in transplant centers for the purpose of downstaging or bridging to transplantation, and palliation in those with preserved liver function and adequate performance status. 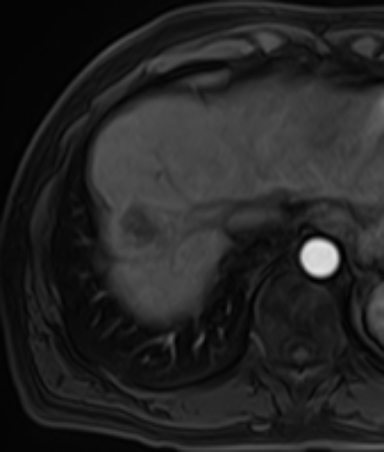 The form of transarterial LRT utilized derives from a comprehensive understanding of the patient’s performance status, oncologic tumor stage, and laboratory results, and is usually discussed at a multidisciplinary conference involving hepatologists, radiologists, and transplant surgeons. 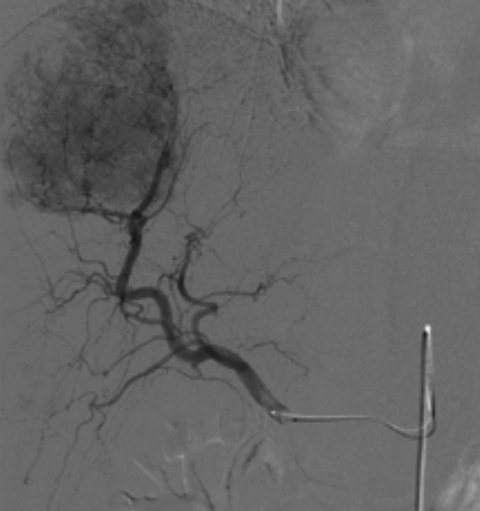 Transarterial embolization (TAE), also known as bland embolization, and TACE consist of the selective angiographic occlusion of the arterial blood supply to a targeted lesion with a variety of embolic agents, with or without use of a chemotherapeutic agent. 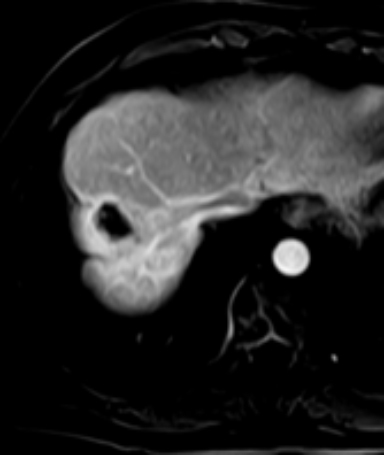 The bland occlusion by embolic particles only, as seen in TAE, results in tumor hypoxia and necrosis. In theory, the addition of chemotherapy produces an additive cytotoxic anti-tumor effect, as seen in TACE. However, controversy exists regarding the efficacy of TACE over TAE and a recent meta-analysis suggests that TAE is as equally effective as TACE at a lower cost point and with potentially fewer side effects.5 For both TAE and TACE, portal venous thrombosis is a relative contraindication. The formal assessment of HCC response to LRT has experienced a natural progression and evolution as our knowledge and understanding of both HCC and LRT has grown. The World Health Organization (WHO) criteria13 followed by the Response Criteria in Solid Tumors (RECIST) guidelines, were early standardized approaches to report degrees of tumor response, recurrence and disease-free interval. 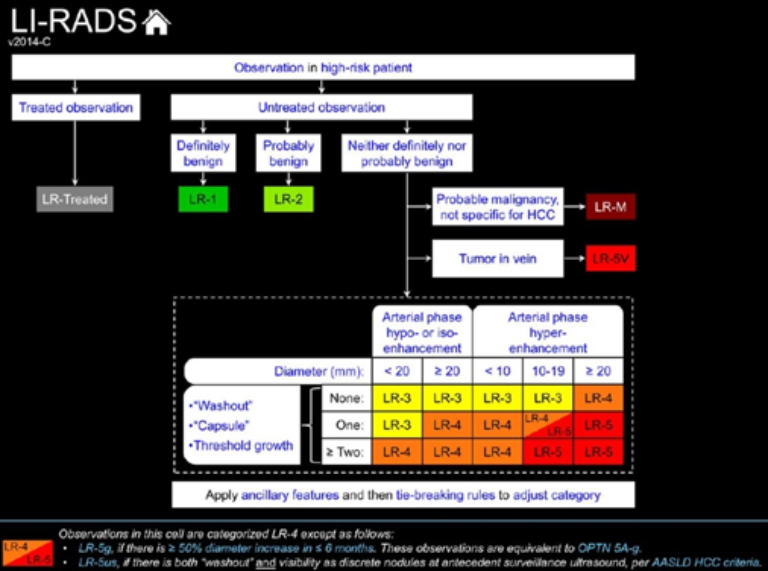 WHO and RECIST provide guidelines in which radiologic observations can be quantified for the measurement of tumor response to therapy and have provided the basis of response assessment in clinical trials.14,15 Both techniques rely on lesion size as the indicator of response, summarized in Tables 2 and 3. 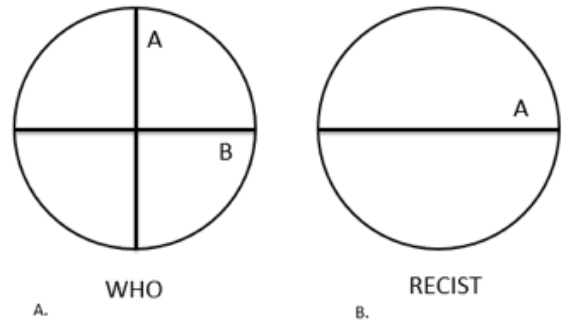 Hallmark to WHO is the bilinear product approach, which is calculated by multiplying the maximal diameter of a lesion by its longest perpendicular diameter, while the RECIST group proposed a model of single linear summation for target lesions (Figure 7). 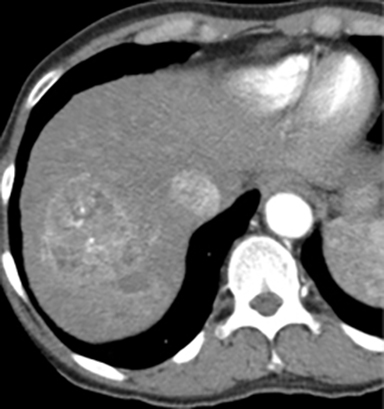 Given the complexities and unique properties of HCC, a more practical model for tumor assessment was required to augment trial design and facilitate clinical management. As a result, the modified RECIST (mRECIST) criteria were proposed and are based on measurements of tumor viability as indicated by arterial phase enhancement19,20 as depicted in Figure 8. mRECIST also include guidelines for assessing pleural effusions and ascites, porta hepatis lymph nodes, portal vein thrombosis, and the development of new lesions. The mRECIST is now the most widely used criteria for assessing tumor response to LRTs. 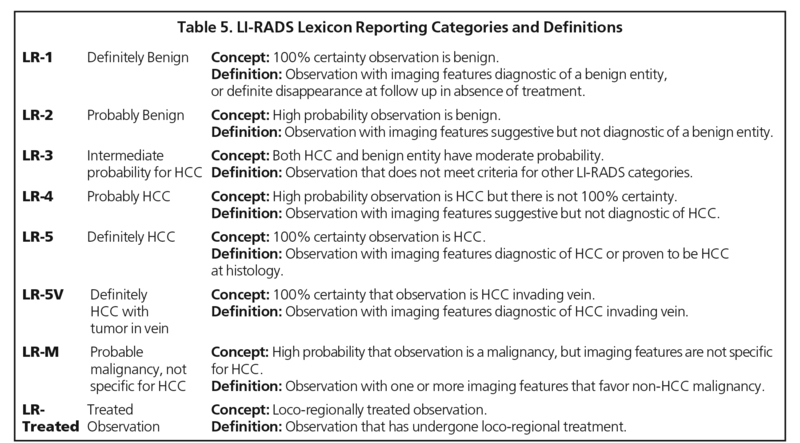 Table 4 depicts the definitions and response categories for HCC according to mRECIST. Modified RECIST standardizes image acquisition, interpretation and assessment. Variables that affect imaging quality can produce inconsistencies in the practical application of this criteria. Thus, mRECIST mandates high-quality dual-phase (arterial and portal venous) imaging (CT or MRI) after injecting intravenous contrast so as not to introduce pseudo-changes related to the method rather than pathology. 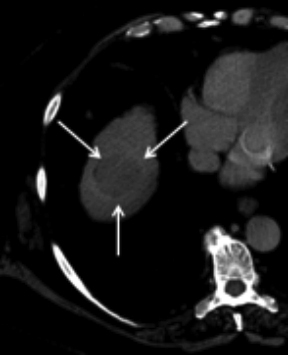 According to mRECIST, for lesions with atypical enhancement dynamics (without arterial enhancement), conventional RECIST criteria must be applied. Perilesional arterial and portovenous phase enhancement is a common benign finding that results from arterioportal shunting after LRT (Figure 9). 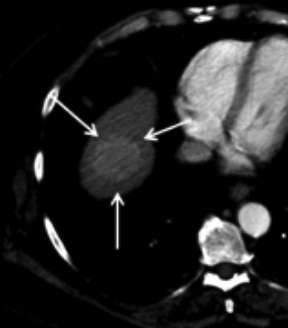 For an HCC target lesion to be assessed by mRECIST, the following must exist: > 1 cm per RECIST, suitability for repeat measurement, and classic intratumoral arterial enhancement on CT or MRI. Therefore, infiltrative forms of HCC should be excluded from mRECIST evaluation. Even with these limitations, the mRECIST criteria allows for reproducible, objective, quantitative measures needed to define a common language between radiologists and clinicians facilitating informed treatment decisions. Functional MRI techniques, such as diffusion-weighted imaging (DWI) have been recently investigated, aiding specificity to locoregional therapy response assessment and outcome prediction.21 Additionally, the degree of fluorodeoxyglucose (FDG) uptake on positron emission tomography (PET)/CT has been widely used as an indicator of metabolic activity in many malignancies and may show promise in evaluating post LRT HCC.22 Future developments using PET/CT and DWI are on the horizon but remain in the research state. 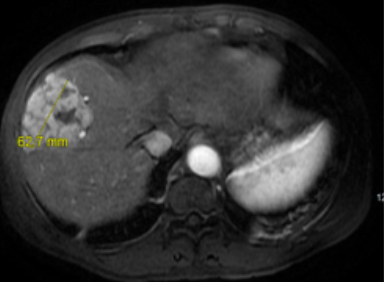 Radiologic assessment of HCC after LRT has substantially improved over time and has become increasingly important to clinicians for patient management. 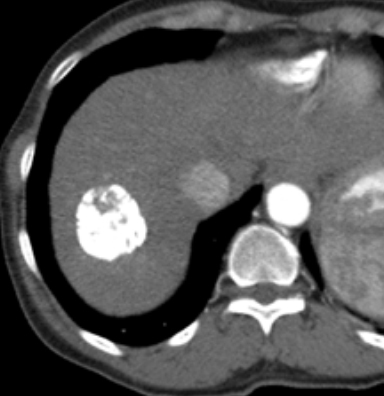 With continually evolving assessment criteria, it is critical that diagnostic radiologists remain abreast of new guidelines and familiarize themselves with the bevy of HCC treatment regimens. At present TAE, TACE and TARE have become cornerstone therapies for bridging to transplant, downstaging to transplant, and palliation of HCC. 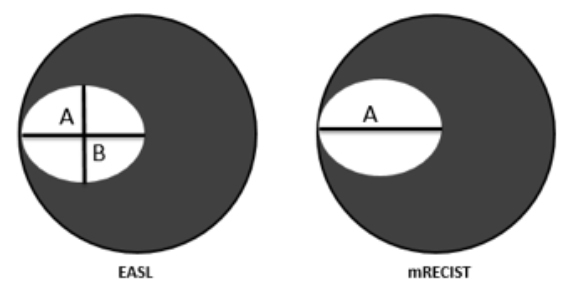 mRECIST has emerged as the standard image-driven means of assessing response to LRTs, serves as the basis for response in clinical trials, and demonstrates significant improvement over prior guidelines. 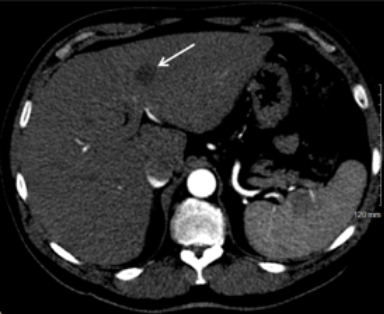 LI-RADS is a structured algorithmic system that standardizes the performance, interpretation, and reporting of lesions on CT or MR in those at high risk for HCC. LI-RADS LR-T lesions can be difficult to evaluate in the presence of benign post-procedural changes and in tumors presenting with a heterogeneous pattern of enhancement. ACR TR-LIRADS guidelines are expected and will likely elucidate the many challenges of interpretation and standardize the evaluation of hepatoma after LRT. Altekruse SF, McGlynn KA, Reichman ME. Hepatocellular carcinoma incidence, mortality, and survival trends in the United States from 1975 to 2005. J Clin Oncol 2009;27(9):1485-1491. Cho YK, Rhim H, Noh S. Radiofrequency ablation versus surgical resection as primary treatment of hepatocellular carcinoma meeting the Milan criteria: A systematic review. J Gastroenterol Hepatol 2011;26:1354-1360. Mazzaferro V, Regalia E, et al. Liver transplantation for the treatment of small hepatocellular carcinomas in patients with cirrhosis. N Engl J Med 1996;334:693-700. Park SJ, Freise CE, Hirose R, et al. Risk factors for liver transplant waitlist dropout in patients with hepatocellular carcinoma. Clin Transplan 2012; 13(6):E359-E364. Tsochatzis EA, Fatourou E, O’Beirne J, et al. 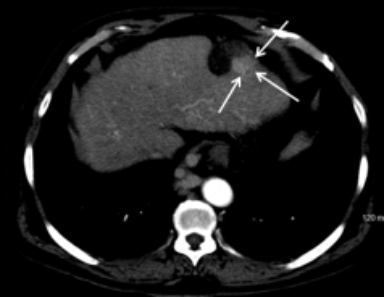 Transarterial chemoembolization and bland embolization for hepatocellular carcinoma. World J Gastroenterol 2014;20(12):3069-3077. Lo CM, Ngan H, et al. Randomized controlled trial of transarterial lipiodol chemoembolization for unresectable hepatocellular carcinoma. Hepatology 2002;35(5):1164-1171. Llovet JM, Real MI, et al. Arterial embolisation or chemoembolization versus symptomatic treatment in patients with unresectable hepatocellular carcinoma: a randomized controlled trial. Lancet 2002;359:1734-1739. Salem R, Lewandowski RJ et al. Radioembolization results in longer time-to-progression and reduced toxicity compared with chemoembolization in patients with hepatocellular carcinoma. Gastroenterology 2011;140(2):497-507. Wigmore et al. 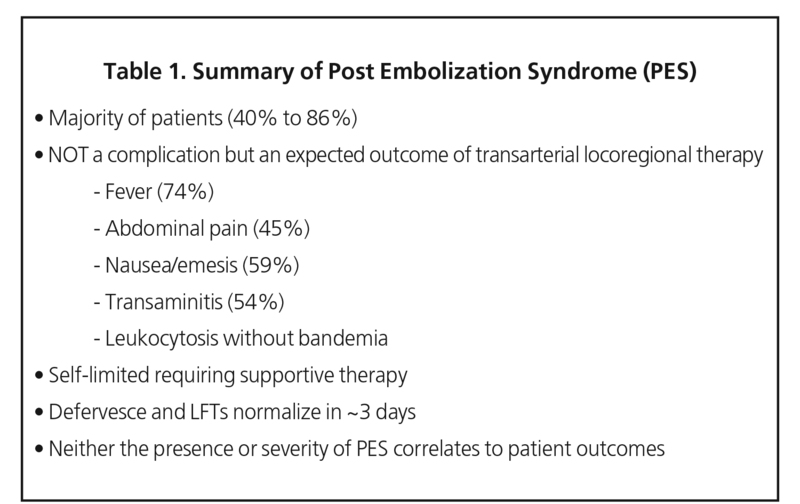 Postchemoembolisation syndrome – tumor necrosis or hepatocyte injury? Br J Cancer 2003;89:1423-1427. Lammer J, Malagari K, et al. Prospective randomized study of doxorubicin-eluting-bead embolization in the treatment of hepatocellular carcinoma: results of the PRECISION V study. Cardiovasc Intervent Radiol 2010;33(1):41-52. Andreana L, Isgrò G, et al. Treatment of hepatocellular carcinoma (HCC) by intra-arterial infusion of radio-emitter compounds: trans-arterial radio-embolisation of HCC. Cancer Treatment Reviews 2012;38(6):641-649. Teo JY, Allen JC, et al. A systematic review of contralateral liver lobe hypertrophy after unilobar selective internal radiation therapy with Y90. HPB 2016; 18(1):7-12. Miller AB, Hoogstraten B, et al. Reporting results of cancer treatment. Cancer. 1981;47:207-214. Yaghmai V, Miller FH, et al. Response to treatment series: Part 2, tumor response assessment—using new and conventional criteria. Am J Roentgenol 2011;197:18-27. Forner A, Ayuso C, et al. Evaluation of tumor response after locoregional therapies in hepatocellular carcinoma: are response evaluation criteria in solid tumors reliable? Cancer 2009;115(3):616-623. Therasse P, Arbuck SG, et al. New guidelines to evaluate the response to treatment in solid tumors. J Natl Cancer Inst 2000;92(3):205-216. Bruix J, Sherman M, Llovet JM, et al. EASL Panel of Experts on HCC European Association for the Study of the Liver. 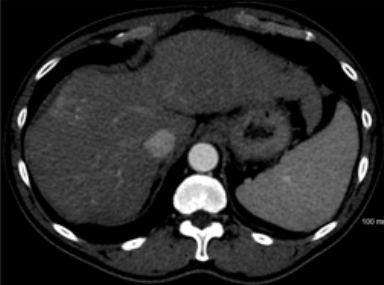 Clinical management of hepatocellular carcinoma. Conclusion of the Barcelona-2000 EASL conference. J Hepatol 2001;35(3):421-430. Bruix J, Sherman M. Practice Guidelines Committee, American Association for the Study of Liver Disease. Management of hepatocellular carcinoma. Hepatology 2005;42(5):1208-1236. Eisenhauer EA, Therasse P, Bogaerts J, et al. New response evaluation criteria in solid tumours: revised RECIST guideline (version 1.1) Eur J Cancer 2009;45(2):228-247. Bogaerts J, Ford R, Sargent D, et al. RECIST Working Party. Individual patient data analysis to assess modifications to RECIST criteria. Eur J Cancer 2009;45(2):248-260. Ludwig, JM, Camacho JC, et al. The role of diffusion-weighted imaging (DWI) in locoregional therapy outcome prediction and response assessment for hepatocellular carcinoma (HCC): The new era of functional imaging biomarkers. Diagnostics 2015;5(4):546-563. Lee JW, Yun M, Chon A, et al. The predictive value of metabolic tumor volume on FDG PET/CT for transarterial chemoembolization and transarterial chemotherapy infusion in hepatocellular carcinoma patients without extrahepatic metastasis. Annals of Nuclear Medicine 2015; 29(5):400-408. American College of Radiology. 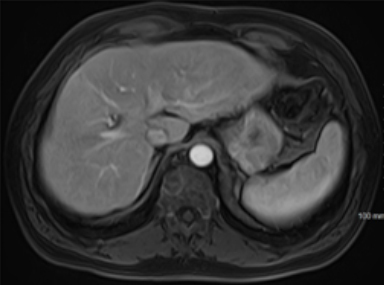 Liver Imaging Reporting and Data System version 2014.thtp://www.acr.org/Quality-Safety/Resources/LIRADS. Accessed May 2017. Montgomery J, Trebelev AE, Bianco BA. 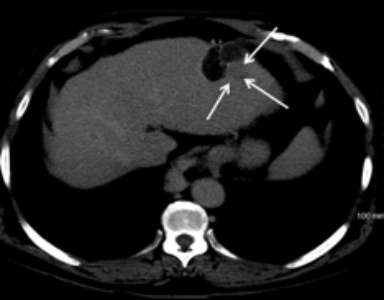 Imaging of Hepatocellular Carcinoma after Transarterial Locoregional Therapy: A Practical Review and Discussion of Treatment Res. J Am Osteopath Coll Radiol. 2017;6(3):5-12. Dr. Montgomery, Dr. Trebelev, and Dr. Bianco work with the Department of Radiology, Hahnemann University Hospital, Drexel University College of Medicine, Philadelphia, PA.